TSE 222: Do Newsletters Still Work? 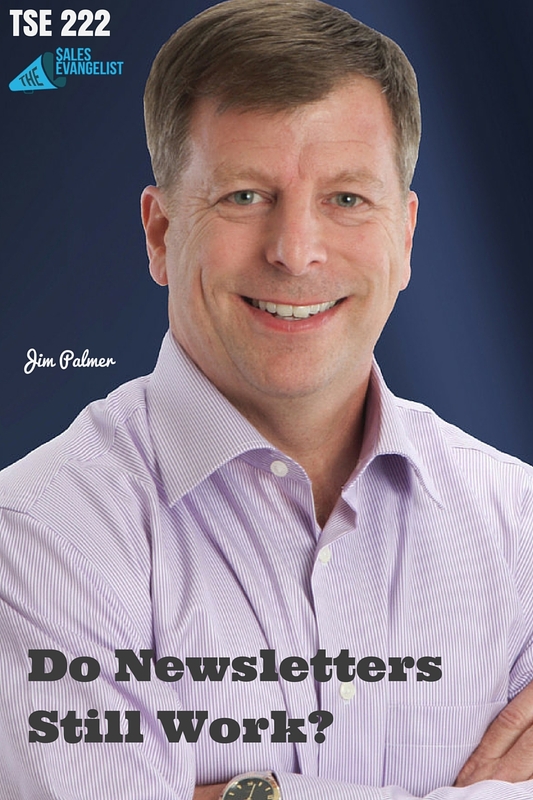 Home » TSE Podcast Post Page » TSE 222: Do Newsletters Still Work? If you think physical newsletters are now obsolete, then perhaps you need to reconsider. Think about it. Not too many people are sending out physical mail nowadays. Everybody else is sending emails and other virtual stuff. And as what I’ve always mentioned again and again, going the opposite direction is key to generating more sales. Set yourself apart from what everybody else is doing. That’s why I’m bringing in the amazing Jim Palmer on the show today. Jim Palmer is a sales connoisseur having extensive retail experience over the years. He started his business in October 2001, writing and designing newsletters for various companies. Five years later, he has created a multiple 6-figure businesses, realizing that he actually created a mammoth job without any lifestyle considering he was doing pretty much everything in that company. Starting over again, Jim now runs several internet-based businesses including two yearly live events called Dream Business Academy and a coaching program for entrepreneurs called Dream Business Coaching and Mastermind Program. Jim is sharing a big chunk of really good insights throughout the show so I figured inserting some of his quotes here in the show notes would be nice. Many salespeople think that increasing profits through higher sales is synonymous with more new customers. Build stronger relationships with them and they will refer more. Create a visual way to illustrate how much money you’re leaving on the table. Not everybody does this anymore. The mere fact you do that will reap gold for you. Why? You remain top-of-mind. Do the 80/20 and offer something more special.